My great-great-grandfather was Thomas Handley, who was married to Elizabeth Cattell on 8th March 1802 at St. Martin’s, Birmingham. Their first seven children were all born in Offchurch, Warwickshire: Thomas (19 November 1802); William Lawrence (25 January 1904); Sushan Mary (2 June 1805); Elizabeth (14 September, 1806); Jane (1 December 1807); Edward (12 December 1809); Charles (25th April 1813). After that John (25 April 1813) and George (21 April 1815) were both born in Tysoe, Warwickshire. Then Sarah (12 May 1816) was born in Miverton, Warwickshire; and Lucy (17 June 1821) and Henry (7 April 1822) were both born in Wolston, Warwickshire. Of these twelve children the sixth, Edward, was my great-grandfather. He married Ann Wheeler, by licence, at Mickleton Gloucester, on 17th March 1831, he being described as a bachelor of the parish of Evesham, employed as a clerk. Ann Wheeler had been born on 8 March 1809 at Inkeberrow, Worcestershire; her parents were Richard and Mary Wheeler. Edward and Anne had 8 children and the records of their births show the family living in a number of places. Their first child, Sara Elizabeth (27 April 1833) was born in Birmingham as was their second child, Lucy Jane (22 June 1835), who died on 21st August 1856. They were both baptised in nonconformist churches in Birmingham. When Sara was baptised the family was living in Bondford Street; when Lucy was baptised they were living in Ravenhurst Street. On both occasions their father Edward’s occupation was given as grocer. Henry was born in 1836 but I have no further details. Edward Thomas (my grandfather) was born on 16th May 1839 in Wolverhampton, where the family lived in Cleveland Street. They were still there at the 1841 census, in which Edward’s occupation was given as a clerk. In 1842 William was born, also in Wolverhampton. When Annie Philadelphia was born in 1843, her birth was registered at Shipston-on-Stour (although in the 1871 census she is shown as having been born in Mickleton, Gloucester). When Charles was born in 1845 his birthplace was given as Wolverhampton. Then, in 1847, Mary Wheeler was born in Gloucester and in 1850 Samuel Heely was born in Birmingham. Finally Helen Ashwin was born, on 24th July 1853, in Birmingham. Edward died on 17th May 1879 and his death certificate shows that he was living at 10 High Holburn, Sedgley and that he was an accountant (retired). Edward Thomas joined the 34th Regiment of Foot on 14 February 1856, at the age of 18. He was awarded the Mutiny Medal with Lucknow Clasp. This means that he was in India by 1857 when the Indian Mutiny (now known in India as the First War of Independence) occurred. He may have been in the Residency from the start or, more probably, was in one of the two relieving columns. After 21 years in the army he was discharged in 1877, having attained the rank of sergeant and having received several good conduct medals as well as the Indian Mutiny medal. 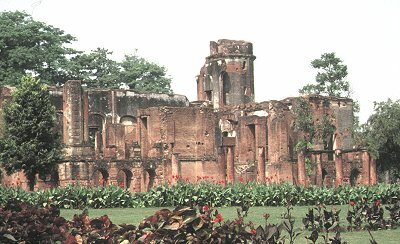 The remains of the Residency, the centre of the Siege of Lucknow during the Indian Mutiny, 1857. The ruins of the whole area are carefully preserved in the condition they were in when the siege ended. Reverse and obverse views of Edward Thomas Handley's medals. Both medals have "E.T.Handley 38th Regt" inscribed on their edges. The medal with the maroon ribbon is "For Long Service and Good Conduct". The other is the India Medal (dated 1857-1858) with the Lucknow clasp. The ribbon is red and white - supposedly, red for the blood spilled and white for the innocents slaughtered. The Indian Mutiny Medal was awarded, initially, to all armed forces involved in the Mutiny, but later it was also awarded to civilians who had taken up arms in the Mutiny. The Medal is unusual in that, unlike many Victorian campaign medals, it was only awarded for service under fire. Even so, 290,000 were awarded. Five clasps were available and these, of course, are much rarer. There are three clasps relating to the siege of Lucknow: "Defence of Lucknow" for the original defence force and members of Sir Henry Havelock's first relief column; "Relief of Lucknow" for Sir Colin Campbell's relief force; and "Lucknow" for those who, under Sir Colin Campbell, took part in the final operations that resulted in the surrender of the city and the clearing of surrounding areas. As Edward Handley has the medal with the "Lucknow" clasp he must have seen active service, under fire, at the close of the Indian Mutiny in Lucknow. Edward's discharge papers show that he had been in the Army (the 38th Regiment of Foot) for 21 years and 21 days, 12 years and 2 months of which had been spent abroad. They also show that he was 5 feet 7 1/2 inches tall, of sallow complexion (the years in India? ), with dark brown hair and hazel eyes. They also say that his trade was "painter" and that his intended place of residence was "Sedgeley". In fact in the 1881 census Edward is listed as a sanitary inspector at Sedgley. Lucy Maude, born 27 May 1874, in Dover. Winifred Mabel, born 1878, in Sedgley (died 1883). Violet Annie, born 2 June 1880, in Sedgley. Francis Meredith, born 19th March 1886, in Sedgley. On 11th July 1918 she married John Joseph Brooks in Coventry; and she died on 26th December 1980 in Salt Lake City, Utah. Sergeant Edward Handley's certificate of admission as an out-pensioner of Chelsea Hospital. This was the process through which an army pension was paid - in this case 27d (or 2s 3d) a day. Alice, born 1895 and died shortly afterwards. Vera May, born 13 September 1896, in Wolverhampton (her birth certificate gives her father, Edward’s, address at 37 Leicester Street, Wolverhampton). Grace, born 16 October 1898, in Wolverhampton. Elsie, born 16 October 1898 and died shortly afterwards. Edward was a stage door keeper at the Grand Theatre, Wolverhampton, until his death in 1906. When he died his army pension ceased and Louisa continued to take in boarders to earn enough money for her family. 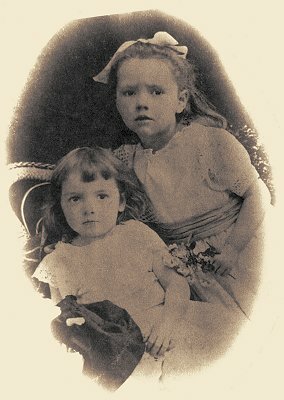 Vera and Grace Handley in a photograph taken in Wolverhampton in 1901. Of the two surviving daughters, Vera May (my mother) married Charles Paul Patrick Heaphy in Wolverhampton on 16 October 1918. She died in Whangerei, New Zealand, on 5 July 1967. Grace married Edward Orlando Terry Tuck, in Auckland, New Zealand, on 23rd February 1925, and died on 28th January 1975 in Auckland. Read my account of Louisa and the theatrical boarding house, and how Vera and her sister Grace came to move to New Zealand. All of this information has come from records of birth, deaths and marriages, census records, army records, parish records and nonconformist baptismal records. But there are gaps. And I keep hoping that there is a huge family of Handley relatives just waiting to be discovered by their New Zealand family. I have been waiting twenty years but I am ever the optimist. Descendants of Edward and Lousia Handley, at Hamilton, New Zealand, September 2000. Leonie Baird (nee Tuck), Val Wood (nee Heaphy), Beryl Huia (nee Heaphy), John Heaphy, Cushla Jamieson (nee Tuck).